“Crossings” (1) published in 1968 has been completely ignored. Released again in 1986 with an afterword by the scholar Amy Ling, this book, partly autobiographical, was considered an essential step in the development of Sino-American literature and as a forerunner to the famous work by Maxine Hong Kingston “The woman warrior “(1975). This is the only book ever written by Stella Yang Copley (1931-2000) under the name of Chuang Hua. Born in China, her family fled to Hong Kong in 1946 and then to England and finally to the United States. The father (Dyadya) doctor in China, became a stockbroker and ensured a comfortable living to his seven children. 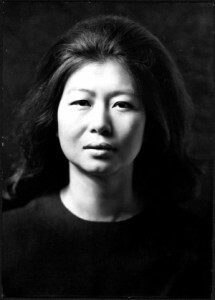 Chuang Hua graduated from Vassar College, and lived in New York and Connecticut. The “crossings” are the Atlantic crossings of Fourth Jane the heroin between the United States and England but also Paris, where she will live a love story with a French journalist. A refuge from patriarchal authority and an attempt to build autonomy. Relations with her lover counterbalance the development of family history. Very few references, places and dates. We must carefully decipher some collages, the chronology is upside down, the stories are fragmented. Stream of consciousness, multiple narrations, these techniques are all used but without the coldness which is sometimes criticized and rightly so with modern novels. Her tone is neutral, impersonal, but very simple and emotive. An elegant writing without the folk references that spoil much of the novels written in the United States by novelists of Chinese origin. The style is indirect and Chinese culture is found more in its themes and concepts than by the limited citations or allusions by the author. Her education, her family, do not solve the problem of identity. She is an American, Chinese American, she says. Her memories of China, that she left as a young girl are important to her. But she says to her lover “I could not live without America. It’s a part of me by now. For years I used to think I was dying in America because I could not have China. Quite unexpectedly one day it ended, I had it in me and not to being able to be there physically no longer mattered “(p.121). But she realizes that the commitment of the United States in the Korean War does not prepare a better understanding. Her pride in being Chinese sometimes leads to difficult relationships. Fifth brother James married a “barbarian” abroad without the consent of his family. His parents would have no doubt preferred a Chinese wife, but they were married away without the family. Fourth Jane shares the anger of her father, but her relationship with her sister in law is worse when she sees that, pregnant, she tries to come closer to Dyadya who is hoping a grand son! The irony of the story is that she falls in love in Paris with a French journalist. A “macho” married, whose wife is expecting a baby. He uses her, has no consideration for her who, in love, does not complain, who lovingly prepares Chinese dishes that he despises. She is told without a protest from her side “I told you never to ask why. You must always be amusing and sweet and never ask why … (p.118). Dyadya is a true patriarch, inflexible, clumsy but loving. He created with his professional success a cocoon for his family in a land of foreign culture and protects them. He makes wrong choices concerning possible matches for his daughter, but admits his mistakes to… start immediately again with a Singaporean who has the double advantage of being Chinese and a financial man! She wants to leave and go to Paris, “how dare you question me! I am Father, I can do no wrong. In opposing me you are a barbarian “(p.196). Dyadya has fulfilled his filial duties towards his own mother and expects the same from his children. For Fourth Jane the death of her father when she was in Paris was a difficult period; she opposed him, she realized that he was disappointed with her. But she also knows that she was treated less favorably than her older sisters, her brothers or even the youngest (“the last born is loved like all the rest but a little more” p.180). Paris was perhaps a neutral ground between the United States and China. A disappointing lover is less important than the way she sees her family and her memories. As said by Amy Ling “as Chuang Hua demonstrates, it is in the simple tasks and responsibilities of living as one recalls them or perform them, that wholeness and motivation may be found”. (1) Chuang Hua “Crossings” – New Directions Classic, 2007, 220 pages.